« The Legacy of Hugh Hefner: Media and Cultural Pioneer – or Merchant of Death? October 13th is the very special 100 year anniversary of one of the greatest public miracles since the resurrection of Jesus. 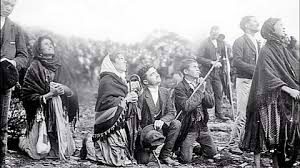 The spectacular and frightening Miracle of the Sun was witnessed in Fatima Portugal by 70,000 people, including many skeptics and atheists as well as devout believers. At the same time as the miracle of the sun, visionary Lucia saw a vision of the Holy Family – Mary with Joseph and the child Jesus who each raised their hands in blessing over the world. The miracle of the sun powerfully echoed the call of the Angel of Fatima to the Shepherd children at the onset of the apparitions to believe, adore, and love God with all our mind, heart and soul. The miracle was also a warning to the human family that was increasingly rejecting the Providence of God and was in grave spiritual and physical danger. At the same time Mary was appearing to the children, revolutionaries were planning the overthrow of the Russian monarchy to establish a movement that would institutionalize blasphemy against God. The Bolsheviks violently seized power in Russia in November 1917 one month after the final apparition at Fatima. The communists launched a massive persecution of the Church in their zeal to wipe out belief in God and the practice of religion in the Soviet Union and later in Eastern Europe and China. What is perhaps lesser known, is the role of the Soviet Union in the spread of abortion. “…history attests to the fact that Russia spread her errors throughout the world… through the single greatest error of our time: abortion. My daughter, look at My Heart surrounded with thorns with which ungrateful men pierce it at every moment by their blasphemies and ingratitude. You, at least, try to console me. The metaphor of sensitive heart tissue penetrated by thorns reveals how closely Mary is attached to us, and how our sinful actions wound her at the deepest level of her being. Mary’s heart was filled with anguish as she appeared to the Shepherd children of Fatima. She warned of the unfolding short and long-term consequences of the spread of atheistic communism and later the rise of the Nazi party in Germany. Our Blessed Mother saw the diabolical power of those destructive ideologies and the political and cultural revolutions that have rocked the world over the last 100 years. Our Lady of Fatima surely understood how the attacks upon the Providential Fatherhood of God would lead to violence against the unborn child, the corruption of human sexuality, and other developments that continue to wreak havoc on marriage and family life. Mary reassured us that even with the massive death and destruction of the last 100 years, in the end, her Immaculate Heart will triumph. Perhaps we are witnessing an anticipation of that final victory of the Immaculate Heart of Mary in the reconciliation and healing of women and men after abortion. Let us pray together for a special outpouring of grace and mercy as we celebrate the 100 year anniversary of the apparitions at Fatima. May this commemoration facilitate a wider awakening to the fervent call of a loving mother to her millions of children that have yet to reconcile their most shameful and grievous sins, and find the healing and peace that only her son Jesus can provide. See for example http://www.liveaction.org/news/the-abortion-ripple-effect-russias-tragic-abortion-tale/; http://time.com/3679288/iceland-abortion/. See for example, http://www.cbsnews.com/pictures/abortion-around-the-world-where-are-rates-highest/19/; http://www.liveaction.org/news/the-abortion-ripple-effect-russias-tragic-abortion-tale/. See, for example, https://www.nytimes.com/2015/10/28/world/americas/in-cuba-an-abundance-of-love-but-a-lack-of-babies.html and https://www.lifesitenews.com/news/china-commits-staggering-23-million-abortions-per-year-according-to-us-stat. This entry was posted on Friday, October 13th, 2017 at 3:34 pm	and is filed under Uncategorized. You can follow any responses to this entry through the RSS 2.0 feed. You can leave a response, or trackback from your own site.